The ball is in the current champion's court. Jon Jones' manager Malki Kawa told Ariel Helwani on Monday's edition of The MMA Hour that Jones wants a title shot against Daniel Cormier on April 23 at Madison Square Garden in New York. Cormier said on The MMA Hour that he'll consider that date and venue, but ultimately he'll be the one making the decisions as to when and where the fight happens. An injury to Michael Graves has forced him out of his bout with Danny Roberts at UFC Fight Night 80. Stepping in for the injured Graves (5-0 MMA, 1-0 UFC) is Nathan Coy (14-5 MMA, 0-0 UFC), who will be making his octagon debut against Roberts (11-1 MMA, 0-0 UFC). UFC announced the first event on the EMEA schedule for 2016. UFC Fight Night will return to The O2 on Saturday February 27 following a successful event in 2014 and continued demand from fans for a reappearance. On Saturday afternoon, Karol Bedorf stepped into the KSW cage and defended his title with a second round head-kick KO win against Michal Kita. As his opponent collapsed to the canvas, Bedorf towered over him as he admired his handy work. The win was Bedorf's third knockout win in his last four fights. It was also the third successful defense of his title. With swelled confidence from his recent string of results, Bedorf revealed that he is interested in a match-up against Russian heavyweight legend Fedor Emelianenko. The Rizin Fighting Federation heavyweight tournament is set, as the promotion announced Monday the bracket and a reserve bout in a press conference in Tokyo. Taking place at the Saitama Super Arena, the eight-man grand prix will feature Satoshi Ishii vs. Jiri Prochazka, Teodoras Aukstolos vs. Bruno Cappelozza, Goran Reljic vs. Vadim Nemkov, and Muhammed Lawal against a yet-to-be-announced opponent. "King Mo", a former Strikeforce light heavyweight champion, is the only fighter still waiting for an opponent, as Mark Godbeer was forced out due to an injury. Lawal will fight a heavyweight from British promotion BAMMA’s roster, Rizin officials announced. In the reserve bout, Valentin Moldavsky takes on Yuta Uchida. The tournament will begin on Dec. 29 and will be completed on Dec. 31. A clean break can sometimes bring closure to a relationship, but it doesn't seem to be the case with Urijah Faber and his former protege T.J. Dillashaw. Caught between the feuding of Faber and his striking guru Duane Ludwig, the UFC bantamweight champ left Sacramento's Team Alpha Male for Colorado's Elevation Fight Team in October. According to Faber, the split hasn't done much to alleviate tensions. "No, it's not relief," Faber told Submission Radio. "It's not the best feeling, to be honest. [Dillashaw] and I aren't the best of friends like we were before. I feel like he's turned himself into a victim in this whole situation. I feel like, in his mind, I'm 'the bad guy' because he left our team. I told him, 'If you're not on the team you can't be coming in here and training with us.' He feels that I kicked him out of the gym. He said it in an interview or something like that, which is comical. Japanese judoka-turned-fighter Satoshi Ishii will take part in Rizin Fighting Federation’s inaugural eight-man heavyweight tournament. Ishii revealed his participation on Saturday via Twitter, and Rizin confirmed the announcement on Monday with a formal announcement. Rizin also announced the withdrawal of England’s Mark Godbeer, who suffered a neck injury in training; Godbeer will be replaced by another representative from British promoter BAMMA. The 2015 Rizin Fighting World Grand Prix launches Dec. 29 and concludes Dec. 31 as part of Rizin’s multi-day New Year’s Eve festivities in Saitama, Japan. Other fighters confirmed for the opening round are “King” Mo Lawal (U.S.), Vadim Nemkov (Russia), Goran Reljic (Croatia), Bruno Henrique Cappelozza (Brazil) and Teodoras Aukstuolis (Lithuania). Carlos Condit talks about Holly Holm's win over Ronda Rousey, why he defended Rousey, his welterweight title fight against Robbie Lawler, his future and more. Mariusz Pudzianowski might be Konfrontacja Sztuk Walki's biggest star, but Mamed Khalidov is the promotion's greatest fighter. Saturday at Tauron Arena in Krakow, Poland, Khalidov proved it once more, demolishing Michal Materla in 31 seconds and taking middleweight gold in the main event of KSW 33. KSW boldily billed the Materla-Khalidov clash as the “biggest fight in European MMA history,” but Khalidov (31-4-2) left little room for anything resembling drama. Within seconds, Khalidov landed a hard right hook that wobbled the champion. Khalidov then sprinted, took flight and bashed Materla (22-5) with a flying knee, another perfect right hook as the champ fell and a dozen rifling punches before referee Piotr Michalak could intervene in barely half a minute. Ronaldo Souza got past every single middleweight the UFC put in front of him inside the Octagon, and he wants no one else besides the champion after UFC 194. Matched up against top contender Yoel Romero on Dec. 12, "Jacare" demands a title shot if he’s victorious in Las Vegas. "I’m not thinking about this," Souza said of the possibility of not being the next in line. "Here’s the deal: I will defeat Romero, and I’ll get Dana White later. I can’t get that matchmaker (Joe Silva) because he’s too small. Dana White is a bit bigger. Boxing: Tyson Fury Pulls Off Shocking Upset of Wladimir Klitschko. The new heavyweight champion of the world is flamboyant, unpredictable, iconoclastic, biting, endearing in certain ways, and apparently has a good singing voice. Not many thought Tyson Fury could beat reigning heavyweight champion Wladimir Klitschko, especially taking on the defending Ukrainian WBA, IBF and WBO heavyweight champ in his second back yard, the ESPRIT Arena, in Dusseldorf, Nordrhein-Westfalen, Germany. But Fury did it. He rocked the world and the Klitschko-dominated, dormant heavyweight division with a stunning unanimous decision, winning by 115-112 on the scorecards of Cesar Ramos and Ramon Cerdan, and 116-111 by judge Raul Caiz Sr.’s tally—despite Fury being deducted a point in the 11th round by referee Tony Weeks for rabbit punching. Former UFC lightweight champion Benson Henderson earned a split decision win over Jorge Masvidal at UFC Fight Night 79 in Seoul, Korea. It was his second win a row, have defeated Brandon Thatch in the Fight of the Night earlier this year. Both bouts were at welterweight. He previously dropped two in a row at lightweight. It was the last fight on his UFC contract. In Seoul, after the decision was announced, he took of his UFC gloves and left them in the Octagon, a ceremonial representation of the end of his current contract with the organization. 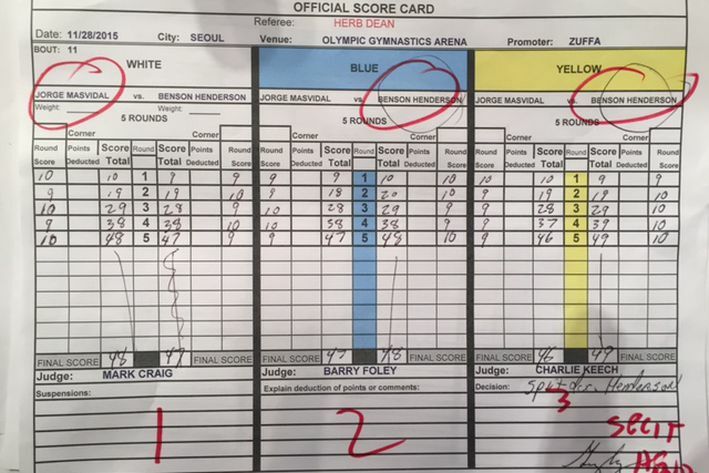 The Benson Henderson vs. Jorge Masvidal UFC Fight Night 79 scorecard reveals another close decision win for Henderson on Saturday morning. Henderson won the fight via split decision (47-48, 48-47, 49-46) at the Olympic Gymnastics Arena in Seoul, South Korea. Mark Craig gave Masvidal rounds 1, 3 and 5 en route to his 48-47 score, while Barry Foley gave rounds 1, 2, and 5 to Henderson for his 48-47 score for Henderson. Charlie Keech gave rounds 2, 3, 4 and 5 to Henderson. It didn't take long for Tecia Torres to get a new opponent. The popular women's strawweight contender will take on the newly signed Jocelyn Jones-Lybarger at UFC 194 on Dec. 12 in Las Vegas, the UFC announced Friday. Torres was initially supposed to fight Michelle Waterson, who pulled out this week due to a knee injury. Niklas Bäckström will headline Battle of Botnia’s return against Bulgarian Georgi Stoyanov. The Swede from Luleå’s opponent was announced today by the promotion out of Umeå for their November 28th event. Tecia Torres has a new opponent for UFC 194. Torres (6-0 MMA, 2-0 UFC) was originally slated to face Michelle Waterson (13-4 MMA, 1-0 UFC) at the event, but an injury forced Waterson off the event. Stepping in on late notice is former RFA strawweight champion Jocelyn Jones-Lybarger (6-1 MMA, 0-0 UFC), who will be making her octagon debut. Russell Doane and Michinori Tanaka will lock horns at UFC 195 in Las Vegas. The bantamweight contest was recently added to the UFC 195 event page on UFC.com. UFC 195 takes place at MGM Grand Garden Arena on Jan. 2 and is headlined by a welterweight championship clash between Robbie Lawler and Carlos Condit. John Dodson talks about why he's moving back up to bantamweight, his most recent loss to Demetrious Johnson, why he wants to fight Thomas Almeida, Holly Holm's victory and more. O'Neil Bell, one of only two "undisputed" cruiserweight champions in boxing's history, was killed in a Wednesday morning robbery in Atlanta, Georgia. The native of Jamaica was just 40 years old. Atlanta Journal-Constitution has more details on this tragedy, including the vehicle description and the number of suspects.